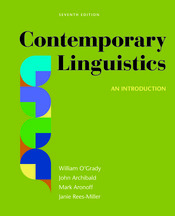 Contemporary Linguistics is one of the most comprehensive introductions to the fundamentals of linguistics, balancing engaging aspects of language study with solid coverage of the basics. Up-to-date scholarship, a direct approach, and a lucid writing style makes it appealing to instructors and beginning students alike. It is a resource that many students continue to use beyond the classroom. LaunchPad Solo for Contemporary Linguistics includes four additional chapters, interactive activities, exercises, and problems, and more. "This is a smart, thorough book. It’s serious enough in tone to be respectful both to the readership and to the discipline, but light enough to allow the authors’ enjoyment of their field to shine through."